Durham, NC, November 30, 2017 –(PR.com)– As the volume of data available to companies increases, so does the need for a robust platform to analyze this data. 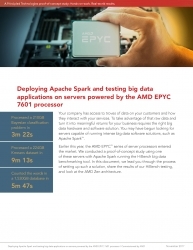 Principled Technologies (PT) deployed one such platform: servers powered by AMD EPYC 7601 processors running an Apache Spark workload. They also tested the solution’s data analysis performance using an industry-standard benchmark tool. The AMD EPYC processor-powered servers can help companies get results in a reasonable amount of time, which in turn lets them reap value from their vast stores of data. To learn more, read the full proof-of-concept study at http://facts.pt/wYnN3r and see the infographic at http://facts.pt/gwgSwr.